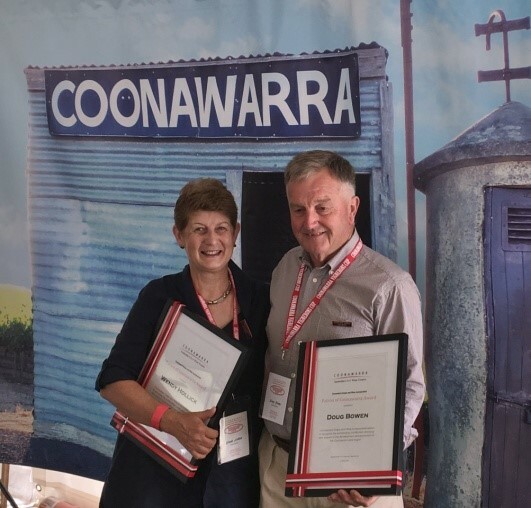 Recently Coonawarra vigneron Doug Bowen was awarded the honour of "Coonawarra Patron" in recognition of his outstanding personal and professional contributions to the development and promotion of the Coonawarra wine region. Fellow Coonawarra winemaker, Greg Clayfield, presented the award to Doug, noting that he has "..a passion for quintessential Coonawarra and has always been a supporter and ambassador for the region." Doug was a founding member of the Coonawarra Vigneron's Association in 1983, going on to serve as treasurer for most of the years between 1986 and 2005 and as president in 1990 and 1991. Doug and co-founder of Hollick Estate, Wendy Hollick, who was also made a Patron of Coonawarra on the day, join existing Patron – Doug Balnaves (Balnaves of Coonawarra). Doug Bowen's commitment to the region since establishing the family owned and operated winery Bowen Estate in 1972 exemplifies the innovative vineyard management techniques he has established and which are a hallmark of the Bowen Estate wine experience and its wines. The 2014 Bowen Estate Coonawarra Cabernet Sauvignon received 96 points and a Gold Medal at the inaugural 2016 Halliday Wine Companion Cabernet Challenge. The wine show was held in Margaret River, Western Australia and the same wine was also awarded "Best of Region" for Coonawarra. 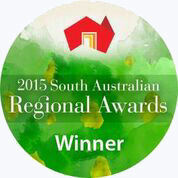 Bowen Estate was among the winners at the 2015 Brand SA regional awards for the Limestone Coast. 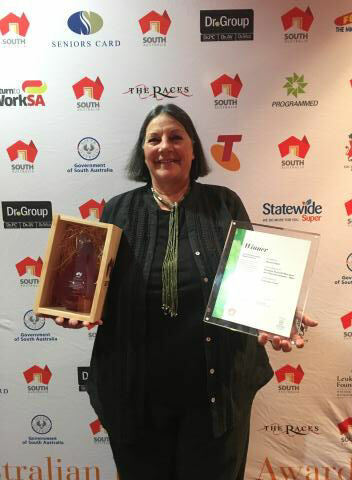 Bowen Estate again won the award for Primary Industries and Regions SA Premium Food and Wine from our Clean Environment recognising more than 40 years of excellence and contribution to the Coonawarra wine industry. Bowen Estate's 2012 Bowen Estate Coonawarra Cabernet Sauvignon has been awarded the 2014 Cairns Wine Show – "O'Connor Law Trophy" for Best Cabernet Sauvignon in Show. Congratulations to our winemakers Emma and Doug Bowen. 2012 Bowen Estate Coonawarra Cabernet Sauvignon – 5 Gold medals, 3 Silver medals and 2 Bronze medals. 2012 Bowen Estate Coonawarra Shiraz – 1 Gold medal, 2 Silver medals and 4 Bronze medals. 2013 Bowen Estate Coonawarra Chardonnay –1 Gold medal and 1 Bronze medal, also receiving top points (91 points) for the James Halliday Chardonnay Challenge for the region. Bowen Estate was among the winners at the 2013 Brand SA regional awards for the Limestone Coast. 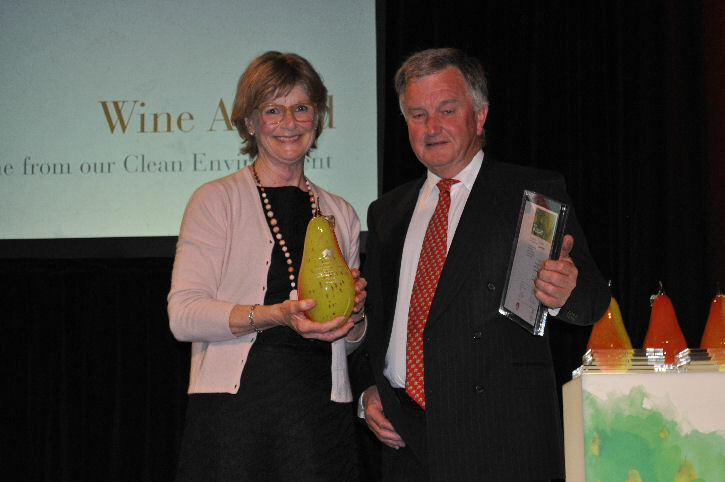 Bowen Estate won the award for Primary Industries and Regions SA Premium Food and Wine from our Clean Environment recognising more than 40 years of excellence and contribution to the Coonawarra wine industry.